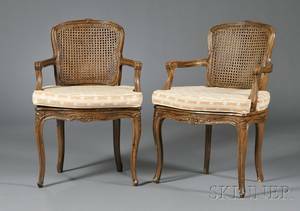 Second half of 20th century. 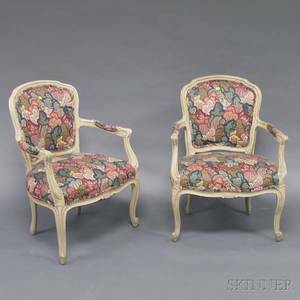 Two matching Louis XV style armchairs with pink, gold, and green fabric with scrolled foliate and floral motif upholstered on oval medallion back, seat, and elbow rests accented with nail head border accents. 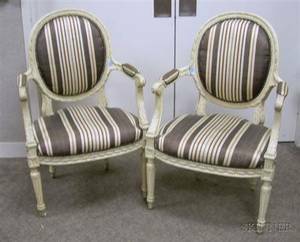 Framed with antiqued brownish gold patina with crackled finish. 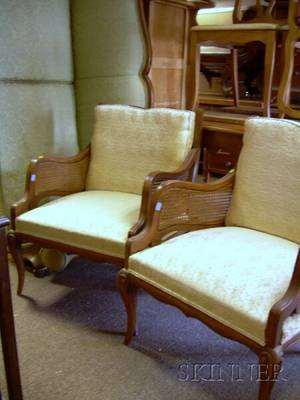 Fabric upholstery visible from back of chair in constrasting fabric cream and green checked fabric. Height 35.5", width 23", depth 21". Seat to floor 16.25". 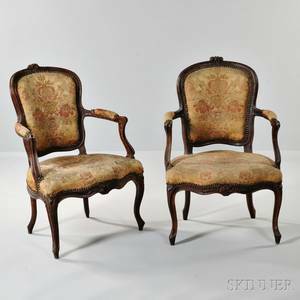 Pair of louis xv style armchairs; walnut frames with upholstered seats and backs, 20th c.; 35" x 23" x 22"
Pair of Louis XV Style Upholstered Painted Carved Wood Armchairs. 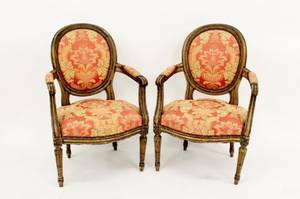 Pair of Louis XV Style Upholstered Carved Beechwood Armchairs. 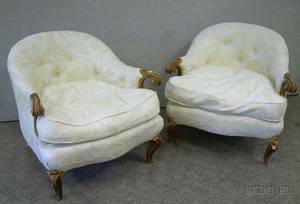 Pair of Louis XV Style Upholstered Carved Giltwood Armchairs. 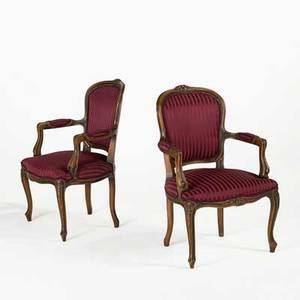 Pair of Louis XV Style Upholstered Carved and Painted Walnut Armchairs. 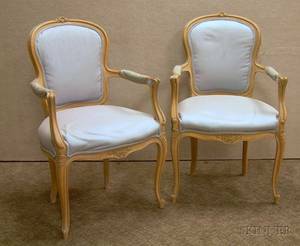 Pair of Louis XV Style Caned and Upholstered Beechwood Armchairs and Sofa Suite. 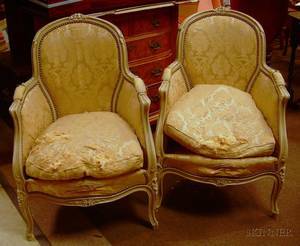 Pair of Louis XV Style Leather Upholstered Carved Beechwood Armchairs.